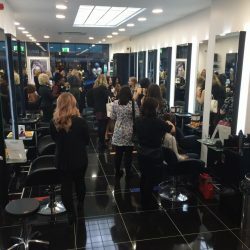 On Thursday 29th September, RUSH hosted an exclusive bloggers event to celebrate the opening of the new Manchester salon. The salon was full of talented bloggers, who received RUSH goodie bags, a glass of prosecco and canapes as they arrived. Over forty bloggers attended the exclusive event which created an amazing atmosphere and buzz of excitement for all who arrived. This allowed the stylists to be creative. They created some gorgeous hairstyles for everyone who came. Each stylist sat with a blogger giving advice and recommendations on treatments to strengthen and colour their hair. Some of the bloggers wrote lovely and positive reviews about their evening at RUSH Manchester. They expressed how much they enjoyed the evening and would recommend RUSH as a salon. The evening was a success. The bloggers and the staff left the salon that evening with smiles on their faces and excited for the launch that weekend of RUSH Manchester. RUSH Manchester is now open!